Download Simplifying Complex Regulatory Complaince and Business Policy Requirements Using EXSYS Online Knowledge Automation Expert Systems. Download the Exsys CORVID Knowledge Automation Expert System Development & Deployment Technologies White Paper. 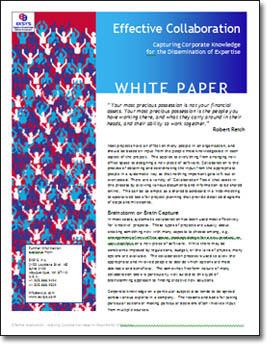 Download the Effective Collaboration White Paper - Capturing Corporate Knowledge for the Dissemination of Expertise.